BIG POWER. BIG PERFORMANCE. SMALL SIZE. Don’t let the size fool you – these powerful tractors, coupled with various attachments, are ready to tackle almost any job. . 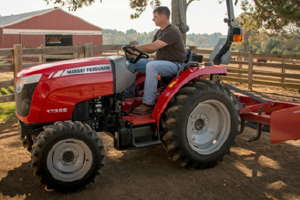 The Massey Ferguson 5700SL Series is one of the most advanced, premium, mid-range tractor we’ve ever made. With its smart and stylish award-winning design, the 5700SL Series features the best visibility on the market, and the latest on-board technologies, too. THE ULTIMATE DO-ANYTHING, GO-ANYWHERE WORKHORSE. Because of its small size, this tractor offers excellent maneuverability, even in tight quarters. Its powerful 110-130 horsepower four cylinder, 4.4 liter engine means it can get any job you need done fast and done right. Plus, our exclusive Hi-Vis hood coupled with the multi-function joystick makes this tractor the best loader tractor on the market. 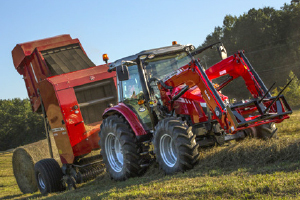 If you need to work efficiently in a variety of conditions, look no further than the Massey Ferguson 5700 Series. 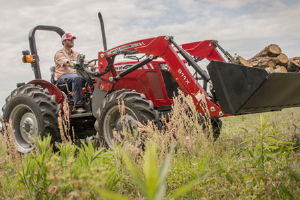 These tractors are engineered from the ground up for smart, versatile, long-lasting operation. They won’t let you down, no matter how demanding the job, and are especially easy to use, with a price point seldom found on this size tractor. Your work is demanding. You want a tractor ready to meet that demand — and then some. The heavy-duty 6700 Series is ready to go when you are, with the power to pull larger, heavier implements and take on even the most rigorous tasks in a variety of conditions and environments. 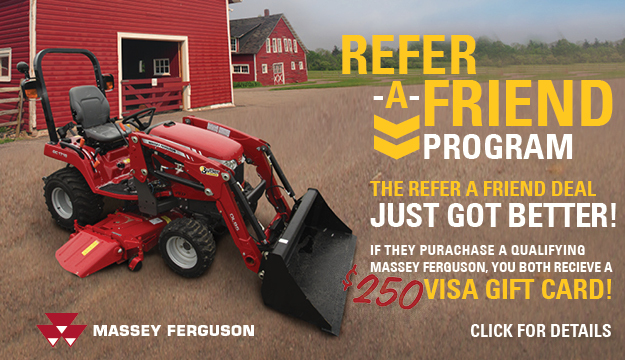 MASSEY FERGUSON UTILITY – CONTACT US TODAY! You’ve got a ton of different jobs to get done every day, and the last thing you need is a lightweight tractor that shies away from the tough ones. That’s why Massey Ferguson 4700 Series tractors are built extra tough to handle bigger jobs, while giving you added stability and comfort. At a best-in-class base weight of 7,125 lbs., the 4700 Series is purpose-built for more pulling power, more lift capacity and greater maneuverability. UTILITY GOES HEAVY DUTY. Hay, dairy operations, small farms and more all need a tough do-everything tractor that can handle the heavy lifting. The 4700 Series tractors deliver, giving you the power and versatility to handle your toughest jobs so you can get more done faster, regardless of the kind of operation you have. YEARS OF INNOVATION LEAD TO THIS. The 4600M Series tractors continue our legacy for a new generation of customers who demand premium quality in a very rugged machine. 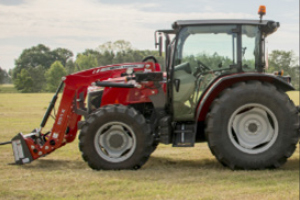 These Tier 4 Final tractors feature a more robust design, with more stability and more lift capacity than ever before. Not to mention a new optional deluxe cab. For more than 160 years, Massey Ferguson has been the benchmark for what a great utility tractor should be. Now we’ve added to that legacy with the 2600H Series, a rugged line of tough and dependable tractors that easy to use, easy to like and easy to pay for. Yet still rugged and durable. Featuring a simple, open design with a hood and fenders made out of solid steel. High capacity hydraulics for loader and implement work. And, of course, the legendary 3-point hitch that Massey Ferguson invented so long ago. RE-WRITING THE DEFINITION OF VALUE. 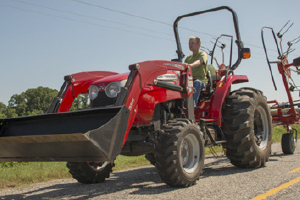 The 2600H Series offers four different models, ranging from 44.4 to 73 horsepower. Within each model, you get the option of 2- or 4-wheel drive. This helps determine your transmission and PTO. Our 8×2 Sliding Mesh and Live PTO give you a more inexpensive option, while the 8×8 Synchro Shuttle and Independent PTO provide even more great features at a low price. These hardworking, matter-of-fact tractors combine the practicality of a compact tractor with the added functionality of a utility tractor. That makes the versatile 2700E Series ideal for loader work, rotary cutting or any other rear PTO job that needs doing. These tractors are perfect for hobby farmers, farm-totable operations, small businesses or just people with a lot of property and a ton of tasks to wrangle. IT’S READY TO GO WHEN YOU ARE. At 12.6 gallons (47.7 liters) per minute, the 2700E tractors have a higher hydraulic flow rate than comparable models, allowing for greater speed in loader work and tasks using other implements. So whether you’re bringing in the hay, cleaning the barn or just doing general land maintenance, the two tractors in this series will not just be handy, but absolutely indispensable. MASSEY FERGUSON COMPACT – CONTACT US TODAY! 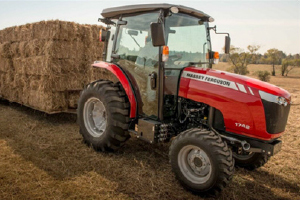 If you’re looking for even more power, comfort, convenience and control, step up to the Massey Ferguson 1700 Series Premium tractors, with advanced engineering that goes above and beyond your expectations. You’ll get performance options common in larger tractors, but with the simplicity and fuel efficiency of a compact. EVERYTHING ABOUT THESE MACHINES IS PREMIUM. All 1700 Series Premium compacts boast a 540 RPM independent rear PTO, or optional mid PTO,* that engages electro-hydraulically with a simple twist of a knob on the front dash. These 36.2 to 59 gross horsepower tractors also include a wet clutch for durability and a modulation button for slow, smooth start-up to prevent shock load damage. The Massey Ferguson 1700E Series is a compact, no-nonsense workhorse that’s easy to operate, easy to afford and easy to love. These 4WD tractors, with standard rear 540 PTO, 3-point hitch and optional backhoe, deliver more than comparably-priced machines. THE E STANDS FOR EFFICIENCY AND EASY. You get durability and legendary performance. Plus, more capability, more functionality and key features like a clean-burning, Tier 4 diesel engine, higher flow hydraulics and your choice of transmission. MATCHED FRONT END LOADER. 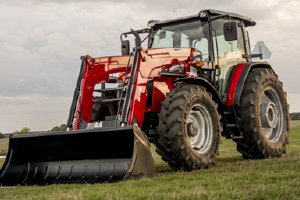 To further improve productivity, the Massey Ferguson loader features a quick-attach main frame design for quick and easy loader mounting and dismounting, as well as a frame-mounted hydraulic joystick for convenient loader control. MASSEY FERGUSON SUB-COMPACT – CONTACT US TODAY! Whether you’re a small landowner or a hobby farmer, everything about the Massey Ferguson GC1700 Series is designed to help you get the job done right. From mowing, loading and backhoe work to snow-blowing and more, these multitaskers deliver impressive performance and unmatched versatility. EASY TO USE. 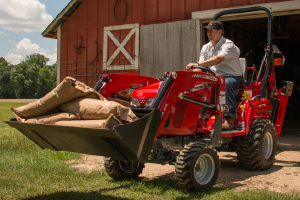 Providing more than just great ergonomics, the operator’s station on the GC1700 Series makes the transition from lawn tractor to small compact virtually seamless. All major controls and functional pedals are in familiar, intuitive locations that are easy to reach and operate. 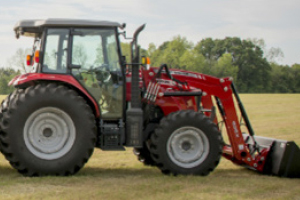 So if you’re ready for a real tractor, check out the GC1700 Series. With the largest engine in its class, it’ll give you all it’s got — and then some. Every single day.